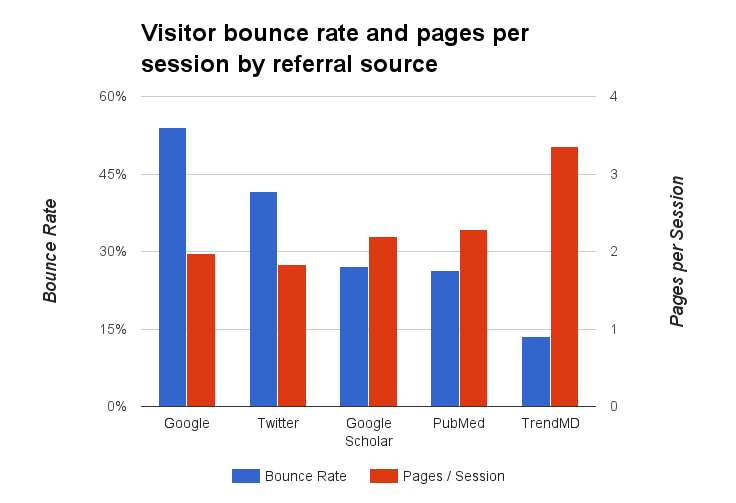 TrendMD visitors are twice as engaged as readers from PubMed and Google Scholar, three times more engaged than Twitter referrals. During September and October 2016, bounce rates for readers referred to the Journal of Medical Internet Research content via the TrendMD widget were half those of readers who used Google Scholar or PubMed, a third of bounce rates for readers directed from Twitter, and a quarter of those of readers who used Google. But why do bounce rates matter? A high bounce rate means that readers aren’t exploring; readers are coming, looking at one page, and then leaving. High bounce rates mean low engagement. Engagement with a site can be measured by bounce rate and pages viewed per session. Bounce rates refer to the proportion of visitors who only look at one page on a given site, while pages viewed per session refers to the number of pages a visitor will look at on average before navigating to a different site. In both respects, TrendMD sent significantly more engaged visitors to JMIR than Google Scholar, PubMed, Twitter, or Google. How much more engaged are readers referred by TrendMD? In addition to much lower bounce rates (13% compared to 26% and above) readers directed to JMIR via TrendMD viewed 150% more pages per visit than any other source. This is 150% more content on a publisher’s site is discovered when the reader is referred by TrendMD. Engaged readers mean more of your content is being discovered on every visit but also increases the probability of readers coming back and continuing to explore later. If you're interested in finding out more about how TrendMD can increase your reader engagement, email us!